Last fall, Stanford University's School of Engineering began teaching a class on developing applications for the iPhone. 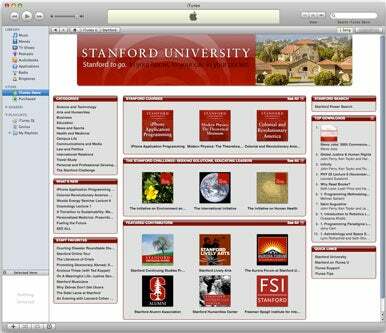 This quarter, you don't have to empty your savings account to attend the class, as Stanford is now offering free video downloads of the class, "iPhone Application Programming," to the public on its iTunes U Web site. The class began this week, and will run for 10 weeks (users can also download slides and other course materials from the Web site for the course, CS 193P). The class is being taught by several Apple employees including Evan Doll, a Stanford Computer Science alum who has worked on the iPhone team since version 1.0 was released. And Alan Cannistraro and Paul Marcos have more than twenty years of Apple experience between them and now work on a variety of iPhone applications. Marcos formerly taught other programming courses in the Computer Science department at Stanford. Brent Izutsu, Stanford’s project manager for Stanford on iTunes U, explained to the Stanford News Service that “working with Apple allowed us to focus our energy on identifying and capturing great content while Apple provided us the technology to distribute it globally.” Students enrolled in the class are required to use an Intel-based Mac for programming, but don't need to own an iPhone or iPod touch—they can borrow one for the course. Students taking the class online will receive the same instruction as those in the classroom, but not receive course credit. Apple reports more 800 million downloads on the App Store so far, making the iPhone a great testing ground for creative entrepreneurs and budding third-party developers. In fact, some of the student-developed applications from the fall-quarter iPhone development class are already available for download on the App Store. The iStanford application, developed in part by Kayvon Beykpou, was written with cooperation from the university and not only provides a campus map, directory, and building information, but also the sense that the university is on board with the iPhone’s ability to help students. The potential for the device is vast and universities are beginning to recognize the education value for students. MIT and the University of Missouri are also offering classes on the subject and Abilene Christian University recently hosted a summit with more than four hundred participants on how to deploy the iPhone and iPod touch in the classroom.